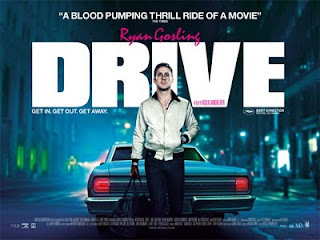 PREVIOUSLY UNTITLED: Lets go for a "Drive"
Lets go for a "Drive"
Drive is not what you expect, if you've seen the commercials you might be expecting something Driver starring Dwayne "The Rock" Johnson or something from the Fast & Furious franchise. It's not, but what it is, is a total breath of fresh air in the action thriller genre. You get this weird mix of violence with 80's nostaglia which oddly fits perfectly with the tone of the film. Great performances from everyone in it from Ryan Gosling playing the simply named character of Driver to Christina Hendricks and Oscar Isacc playing the characters of Blanche and Standard. Another amazing performance was that of actor Albert Brooks who is ususally a funny guy but in this plays the menacing villian of the film. I'd highly recommend going to see this, just be ready for something different than the usual.